Over the next few weeks, I’m ecstatic to be sharing all about our wedding and the festivities that came along with it! Though our wedding was about three months ago, it still is so fresh in my memory, and I love remembering how special every single event was. It truly was the perfect, perfect wedding weekend in every way, and Rob and I know how deeply blessed we are. all of my beautiful bridesmaids! Our immediate families traveled into town on Wednesday and Thursday, and we were so glad to have everyone in Raleigh to celebrate a few days before our wedding! The first big event to kick off the wedding festivities was for the ladies, and it was my bridesmaid luncheon. The Carolina Inn in Chapel Hill graciously hosted this beautiful event for me, and they went above and beyond to love on us well! The Carolina Inn is an incredibly special place: I lived just across the street from it my senior year of college, it’s a beloved place to any UNC grad, my sister and her husband were married here four years ago, many of my friends have celebrated their wedding festivities here, and I even plan many weddings at the Inn! 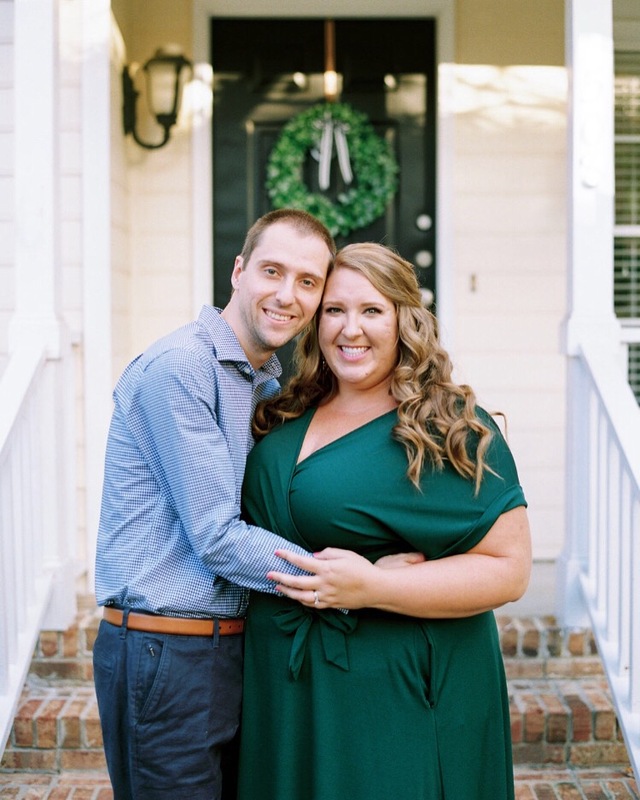 I was so incredibly grateful to have the Carolina Inn play a part in our wedding weekend, and I’m so glad the ladies in my life were able to experience (or re-live!) its charm and beauty. I invited all eleven of my bridesmaids, my mom, Rob’s mom, my new sister-in-law, and my aunts and cousins to attend the luncheon, which is a definite Southern tradition! I know my dad and Rob were a little jealous they didn’t get to partake in the delicious fare of the Inn (though I know some of Rob’s family enjoyed the Inn’s restaurant while we lunched!). Even though I chose the menu and the linens for the bridesmaid luncheon, it was even more beautiful than I imagined when we walked into the Club Room! It really took my breath away, and I definitely cried a happy tear or two. It was definitely a “pinch me” moment… knowing I was celebrating our upcoming marriage with the ladies closest to me, that everyone had traveled from so far for us, the love, support, and encouragement of my family and friends throughout my entire life, and that the Carolina Inn was the stunning backdrop of this special luncheon! my sister/best friend/MOH + me! I wanted this to be an uber-girly, fun luncheon to celebrate how special my bridesmaids and our moms are to me, and I wanted to spoil them! The Club Room at the Carolina Inn is picture perfect, oh so Southern, and quintessentially “Carolina” with the blue walls and white trim. I wanted one big table for all of us to sit it, and it was adorned with a salmon pink linen, topped with blue and white hydrangeas, and I even added in my own gold pineapples to the centerpieces. I set out hand-calligraphed placecards for all my guests, thank you notes for all the ladies, and their bridesmaid gift bags, filled with all their goodies. (You can see what I gifted them here!) This is also when I gave our moms their special gifts, as well. The pink, white, blue, and gold decor made me so happy, and it was even better when all of my bridesmaids arrived for their celebration! We dined on baked brie with berries and honey, chicken salad with biscuits, fresh fruit with a trio of amazing dips, sweet potato fries, and then beautiful key lie pies that were adorned exquistely! There was also champagne, of course! The Carolina Inn definitely outdid themselves with the menu, the food, and the service. It was absolutely delicious, the staff was impeccable, and I know we were all so full and satisfied! It was the perfect Southern meal, and I loved being surrounded by all of my best friends, our moms, and some of my family. They are the best of the best, and it’s hard to put into words how blessed I am by these friendships! I know how lucky I am to be surrounded by the most loving, fun, thoughtful, kind, wise, supportive, and encouraging women in the world!! A huge, huge thank you to the Carolina Inn for hosting us for my bridesmaid luncheon – y’all are the best!! This was the best!! The aesthetics were you to a T! And you know I love any reason to go back to the Carolina Inn – such a special and beautiful venue!